The National Institute of General Medical Sciences explains that circadian rhythms are significant in regulating sleep patterns. Circadian rhythm refers to the patterns of mental, physical and behavior change that occur in a daily cycle in response to darkness and light in the environment. When circadian rhythm is normal, melatonin, a natural chemical released in the body to induce sleep during darkness, is produced normally. Disrupted circadian rhythm, however, influences the development of sleep disorders and symptoms of sleep disturbance associated with seasonal affective disorder and depression. Light therapy is the artificial exposure to light from a homemade or manufactured light box that mimics outdoor light. Light therapy exposure is intended to alter the circadian rhythm in order to suppress and re-pattern the production of melatonin. Obtain a physical health checkup and lab work to determine the cause of tiredness. Several different medical conditions can influence changes in your sleep pattern. Chronic fatigue syndrome (CFS) is a convergence of conditions that leads to chronic tiredness. Seasonal affective disorder (SAD) is a condition that includes tiredness when darkness is more prominent than light. Complete a checkup to rule out the need for specific medical treatment unrelated to tiredness. Purchase or make a light box to begin therapy. Light therapy is intended to stimulate natural chemicals in the body such as serotonin, dopamine and melatonin for sleep regulation. Light boxes are available for purchase online or you can make your own. Important factors to consider for your light box include the light intensity in the box, when to use the box and for how long per day to achieve optimal results, the Mayo Clinic explains. Arrange your daily routine to include light therapy. To regulate your circadian cycle use the light box in the morning. The Mayo Clinic notes that using the light box at night will disrupt your sleep further. You may have to begin your day earlier than normal while using the light box–however the benefit of light therapy in regulating your sleep pattern is worth the inconvenience. Engage in an activity while using your light box to prevent boredom. With the light box a few feet from you, read a book, watch television or call a friend. Activities will not disrupt your light therapy unless you leave the vicinity of the light box. Consider revisiting other options for tiredness if the light therapy treatment does not help improve symptoms within a month. 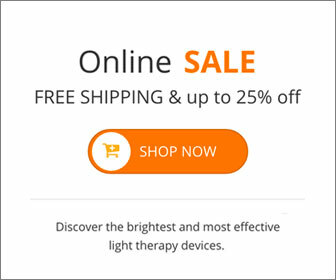 Light therapy is not the only option for treating tiredness–however, give the technique a full month before deciding to find a new route. Go outside during the day to obtain natural light in conjunction with your daily light therapy. Watch your diet as unhealthy habits may contribute to persistent tiredness. Consider incorporating light exercise into your daily routine to further stimulate energy and wakefulness. Temporary eyestrain and headache may result from use of light therapy, however, side effects from this technique are rare. If you are taking antidepressant medications, talk to your physician about interactions with the light box. Some antidepressants are light sensitive. This entry was posted on Monday, June 13th, 2011 at 8:29 am	and is filed under Light Therapy. You can follow any responses to this entry through the RSS 2.0 feed.